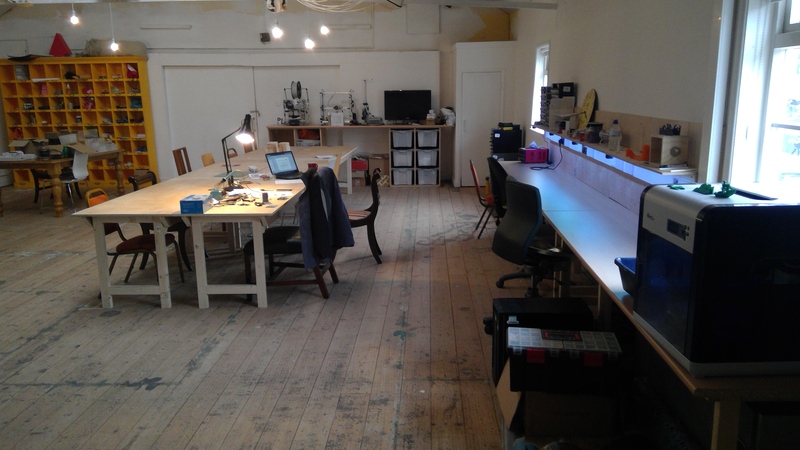 Following on from our last great Open Day we’re throwing the doors to the Makerspace open once again. 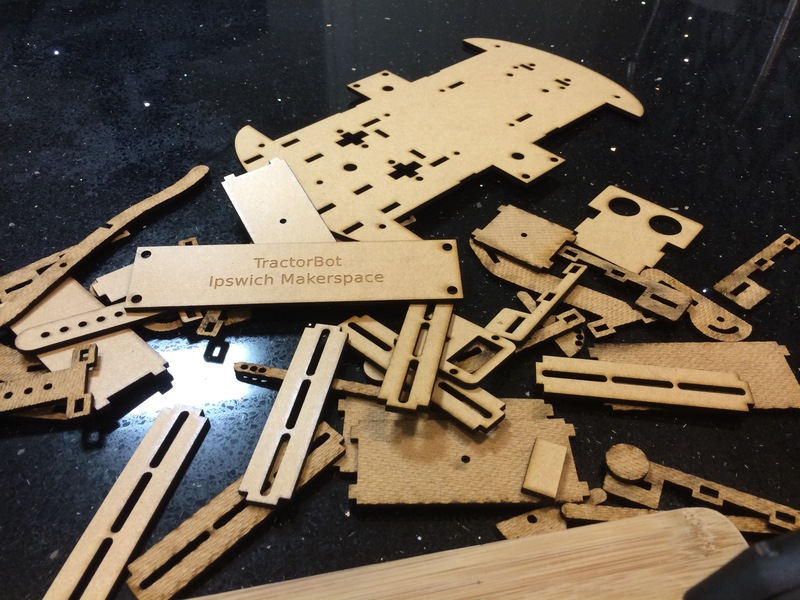 If you’ve ever wondered what a Makerspace is, now is your chance to find out. Depending on how busy we are you may even get some help and advice! Come along, meet the team and see some of our equipment in action. There’s parking just next to the Makerspace which costs just £3 all day. Click here for details of how to find us. 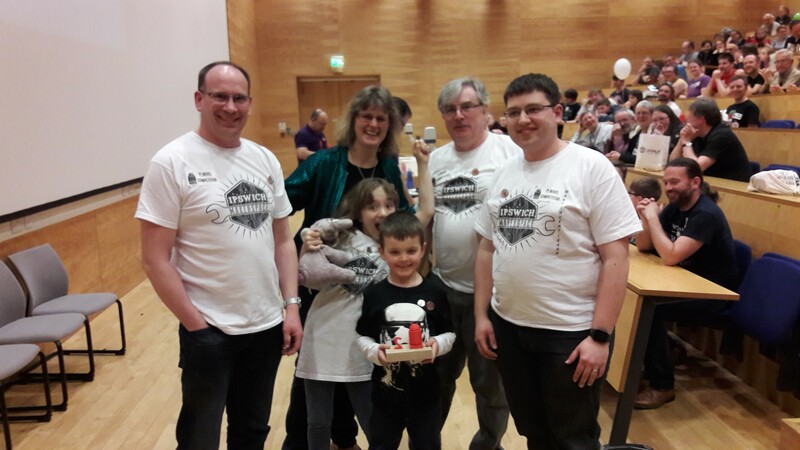 A local team of robot builders from Ipswich Makerspace took second place in the Cambridge PiWars competition at the weekend. They entered the Professional category in the prestigious robotics event, a challenge-based robotics competition in which robots created by teams compete in various non-destructive challenges. The Makerspace’s team competed on Sunday and got off to a rocky start getting knocked out of the Pi-Noon robot duel in the first round despite some skilful moves by the driver Jon Leach. They also had issues with the bright sunlight on the course for the Maze and Speed challenges. In training the robot had operated flawlessly under artificial light but the sun interfered with the sensors on the day. The team quickly recovered with an excellent run on the autonomous Line Following and a blistering time for the Crazy Golf with Phil Willis in control. A solid performance on the grinding Obstacle course boosted the team’s morale no end. The final challenge was to present the robot to be judged by Dr Lucy Rogers one of the judges from recent series of Robot Wars. Under Dr Rogers’ critical eye the team explained the highlights of their design helped by Phil’s 10-year old daughter Amy. The team captain Keith Ellis said “It’s amazing what we were able to achieve with modern technology. 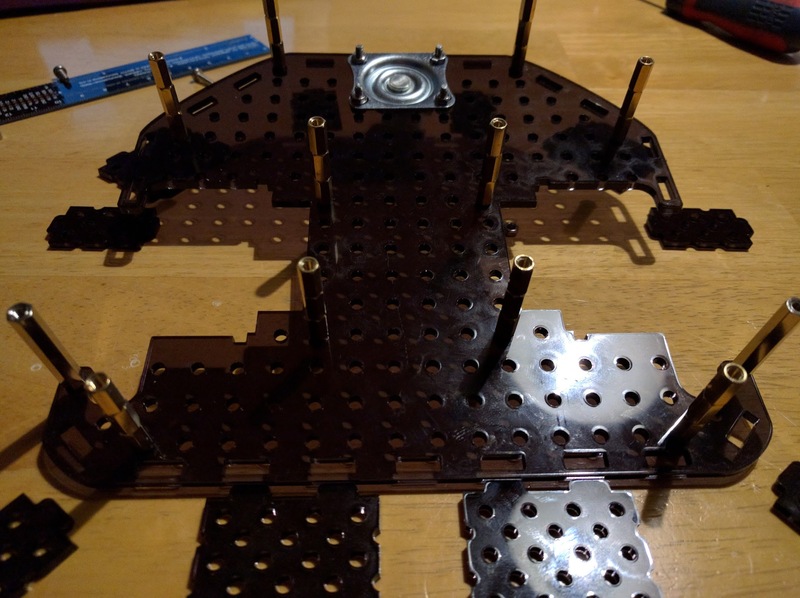 Parts were laser cut and 3D-printed, we had custom circuit boards made and we even made use of Open Source computer vision software; 10-years ago we couldn’t have built this robot”. 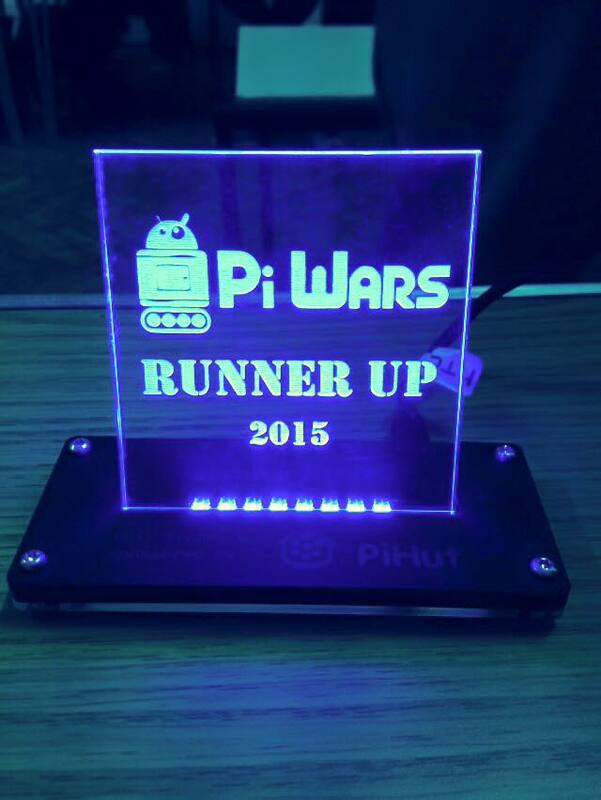 Steve Chalkley from Ipswich Makerspace said “This was our third PiWars and we’ve been in the top three in each one. We’re very proud of our team and grateful to Rapid Electronics in Colchester for their sponsorship. It allows us to be more adventurous with our designs and produce winning robots”. Left to right: Keith Ellis, Dr Lucy Rogers (Robot Wars), Phil Willis (Amy’s Dad), Jon Leach. Front Amy Willis and Harrison Ellis (holding the trophy backwards, bless). Dr Lucy Rogers is a chartered engineer, who appeared as a judge in the two most recent series of Robot Wars. She is a Chartered Engineer, Fellow of the Institution of Mechanical Engineers, the Royal Astronomical Society, and the British Interplanetary Society. Her current projects focus on reducing the damage from space debris. At the PiWars weekend Dr Rogers judged the technical and innovation elements of each team’s robot. 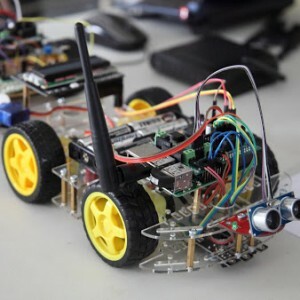 Pi Wars is a challenge-based robotics competition in which Raspberry Pi-controlled robots are created by teams and then compete in various non-destructive challenges to earn points. There are prizes awarded at the end of the event. At the weekend teams from schools, families and groups of hobbyists competed for two full days of robotic fun and games. 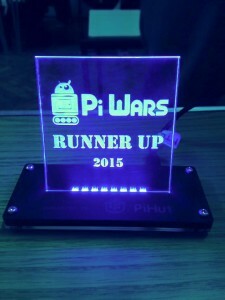 Pi Wars took place in Cambridge, UK and was open to anyone from around the world. This year there was even a team from the USA. 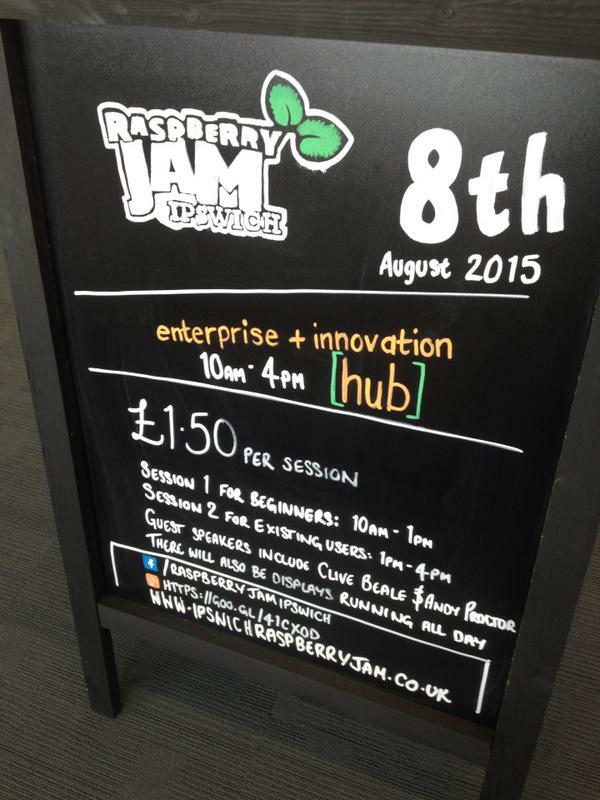 It is run by the same team that organises the Cambridge Raspberry Jam. A big list of things to talk about and prioritise but I propose a working party next saturday (11th) to make a start. If you want to get involved but can’t make this Saturday have a chat with one of the committee members to let them know. Chances are we’ll be doing stuff on Thursday evenings too as long as it’s not intrusive. Also mention anything you think we’ve forgotten. Main table and chairs – we need to decide what we want the place to look like, but having a big cluster of tables has worked well in the past. I’d quite like to make tables similar to the ones we used in the church hall as buying them is damned expensive. 18mm ply works well or something like scaffold planks are quite ethnic too. Having tables we can move/stack would be extremely useful for hiring out the space purposes. Chairs are available cheaply from the Foxhall recycling centre and I may have a bunch of stacking chairs we could use. Electronics workbenches – up to four stations with a good set of basic tools like a psu, soldering iron, monitor etc setup along the wall between the heaters so people can just rock up and get to work. Not exactly a quiet area, but definitely a work area. Lighting (I know it’s not furniture), it’s a bit poor at the moment. We can double up on the lights we already have (somehow). If we go down the cluster of tables route we can put in a row of decent lights over it. We should also replace the current bulbs with LEDs for energy efficiency. Create leaving checklist to ensure space is secure and nothing is left on. For several weeks we have been in negotiation with the owner of 11 Dove Street to acquire the lease and finally have a place to call home. Barring accidents we will be signing the lease this week. What does this mean for the Makerspace? Having our own space gives us the chance to develop the Makerspace in ways we’ve not been able to before. We can look at getting more tools and equipment, offer more activities and reach out to more makers. And of course we want to make all that equipment accessible and convenient so you don’t waste half the session getting set-up. To make Dove Street the exciting and above all useful space we all want is going to take money. There’s the up front cost to acquire the lease, some for things like insurance and security, practical items such as tables and chairs and then for the additional tools and equipment. We have decided to offer everyone a chance to fund the Makerspace by purchasing “Founder’s Bonds”. We have such confidence and enthusiasm for this venture that the committee members have already pledged £6000 with a further £2000 under discussion. Each bond costs £100 and the funds will be placed in a special account and allocated to projects by the Makerspace Committee. We want people to look on the Makerspace as a long term venture and so the minimum term of the bonds will be three years. After that time bond holders will be able to apply to have their bond repaid and the Makerspace will make reasonable endeavours to do so subject to common sense and the availability of funds. As a benefit, bond holders will be entitled to a 3% discount off their annual membership fee for every £100 bond they hold for as long as they hold it. The lease deposit, legal fees and fixtures and fittings will cost us up to £4900. We will also need some working capital to cover any shortfall in the running costs until the we can expand our membership. What is to become of the rest of the funds? Firstly, we want to secure the building, particularly the front door which is currently the weakest spot. In the long term we also want to install an entry system to allow members to come and go 24/7. We will need to replace the furniture as it belongs to the current lease holder, but we will be keeping the kitchen. The next step is where it gets exciting. As many of you know I’m very keen to get a laser cutter and, funds allowing, I will push to get one as soon as is practical. 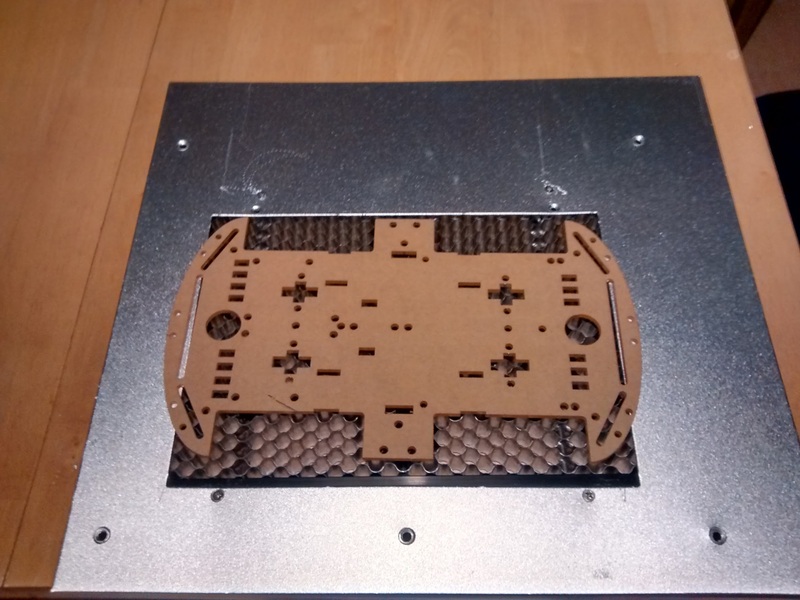 Jon Leach has offered to lend us his CNC machine, Dan Sloane has lent us his Rigol scope, add that to our 3 x 3D printers and you have a fantastic resource for makers. The space could also benefit from a wide range of smaller tools such as crimping tools, assorted screwdrivers, power supplies and many more. We already have a stock of resistors and capacitors, JST sockets, assorted wire etc. but it would be very useful to also stock things like nuts, bolts, screws and washers, stand-offs. There’s truly nothing worse than making good progress on a project only to have to stop because you’re missing some tiny piece of hardware. The regular Thursday evening makerspace meetings will continue as usual and we will also try out a range of alternative events to see what works best. If you have an idea you’d like to help get off the ground or a project you’d like to see happen then please talk to a member of the committee. We want to get our funding in place as quickly as possible to be able move forward and so we need all applications for Founder’s Bonds to be received by midnight on Friday 17th February. 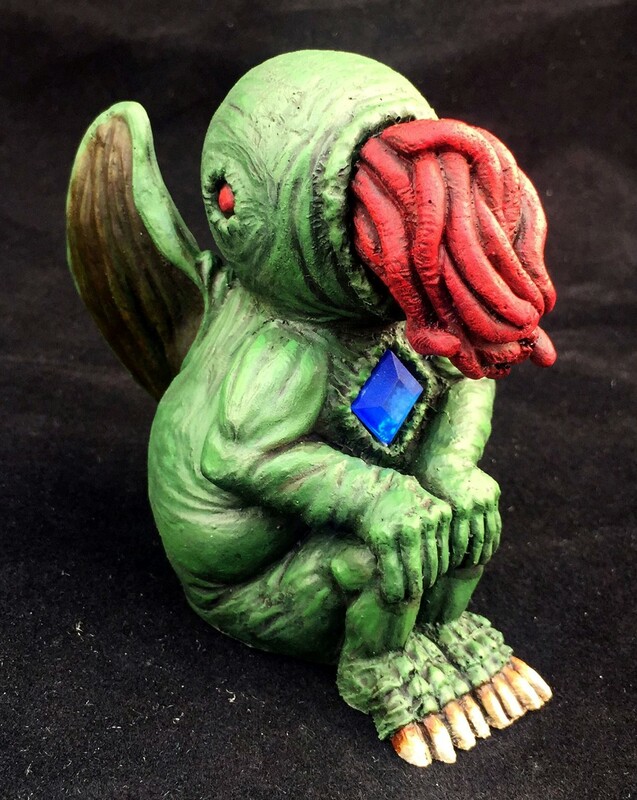 Always remember that this is your makerspace and your help can make it really fly. 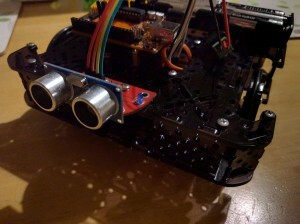 Things have been progressing with TractorBot II over the past few weeks (sort of). Phil has now coded a menu system via a 2-line LCD screen, which is a significant improvement over last year’s LEDs and buttons. Hopefully this will take the guess work out of what program will run when we press GO. We found the menu very handy last year, we could just boot the Pi and select the program without having to SSH in and run the code. 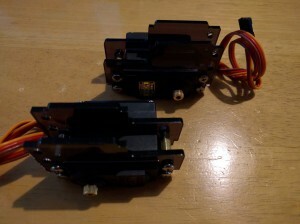 This will be a good improvement for PiWars 2015. We have been researching better motors, but oh my, motors are so complicated. It’s hard to get a reasonable combination of values for speed, torque, size, cost and current drain. So many variables, our heads hurt, lots. 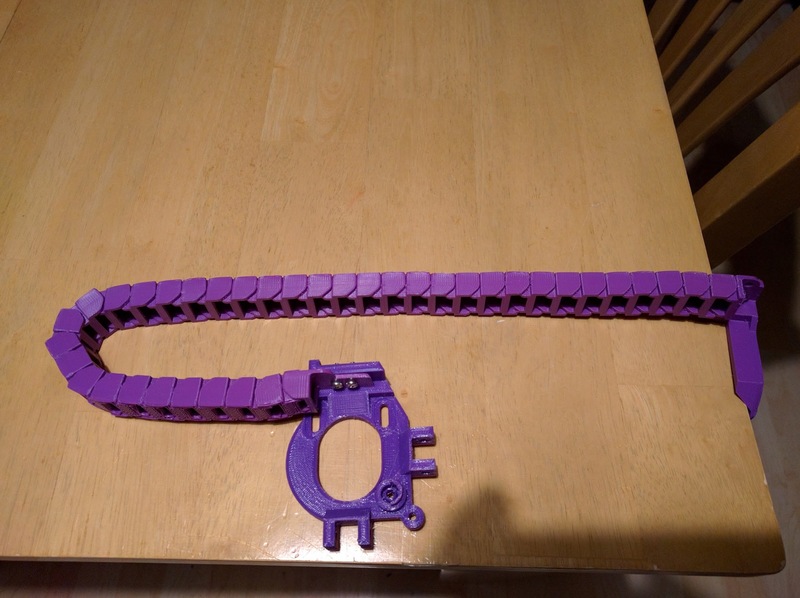 Keith designed a mount for one of the motors we’ve been testing and Phil 3D printed it. We’ve chosen different motors now, so this is redundant, but the renders look very cool though. Jon is playing about with an I2C distance sensor. It’s been working on an Arduino and he’s converted the code to get it running on a Pi. This will give us an analogue distance, similar to an ultrasonic sensor but without the timing issues associated with a Raspberry Pi. We hope this will stand us in good stead in the proximity challenge. 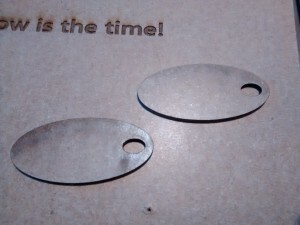 Oh, we also have some bad news, Andy’s laser cutter has failed and it’s looking like it will cost up to £1000 to fix. 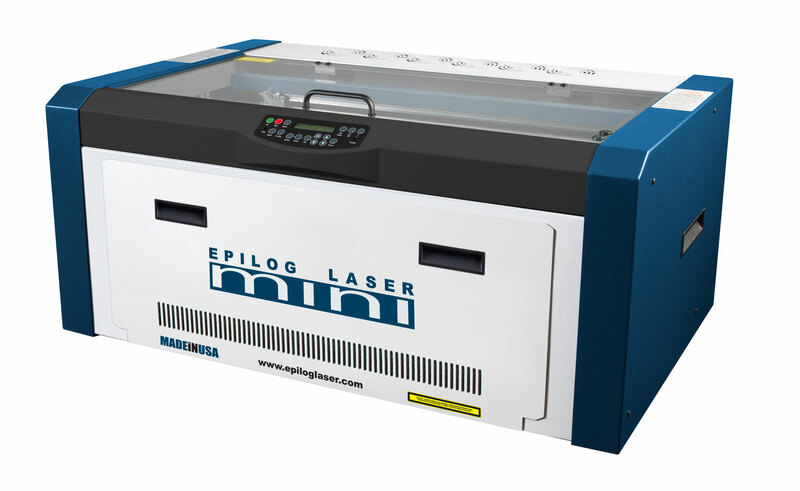 If anyone has suggestions on getting an Epilog Mini controller board up and running again we would be interested to hear them. It looks like a voltage regulator has given up the ghost. Today we’re going to have some background on one of our team members, and get hints and tips about prototyping using a laser cutting service. Phil started getting interested in computers at age 7, when his Dad took him to work at Essex County hospital where the Pathology department had a PDP 11 running BASIC. It ran several games including lunar lander and golf…….. all on paper via state of the art Teletype 33. Later at secondary school, he started programming in BASIC and Forth, using a shared acoustic coupler terminal connected to a huge black and white TV and the county main frame. This experience was only for the chosen few and amounted to only a few minutes of computer time a week. By now hooked, a series of computers came into his life, Acorn System 1, ZX80, ZX81, Spectrum and QL as well as those at Hatfield Poly where he got a degree in Electronics and Computing, learning PASCAL, C m16e, z80 and 6502 assembler. After Poly came work at a local computer supplier writing printer drivers for a word processor running on the Commodore PET. Then on to building clone PC’s and writing some of the first PoS(Point of Sale)/PoI(Point of Information) systems using Amiga 2000’s. In the early 90’s Phil started working for QTMS, a company specialising in monitoring printing presses and other ancillary equipment and somehow is still doing it after two buy-outs and going from a company of 6, to one of 3000. 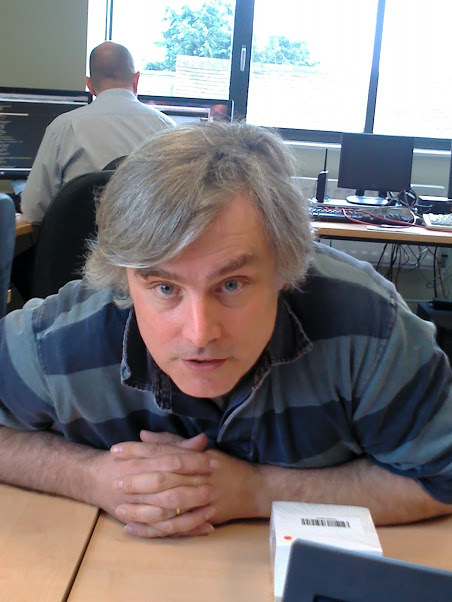 Currently, Phil leads a team of 4 programmers spread throughout the UK and the USA. At home, he enjoys cooking, swimming and building robots with his children. Phil lives in Suffolk, with his youngest daughter “Miss Steady Cam” (Cheerleader for the TractorBot team). With Keith, Phil designed and built the makerspace’s 2014 PiWars entry. 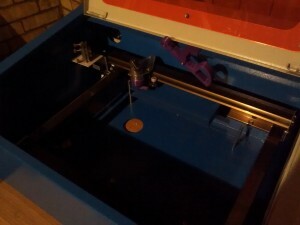 Recently Phil sneaked a Tractorbot II out of its high security vault and showed it off at the CamJam. 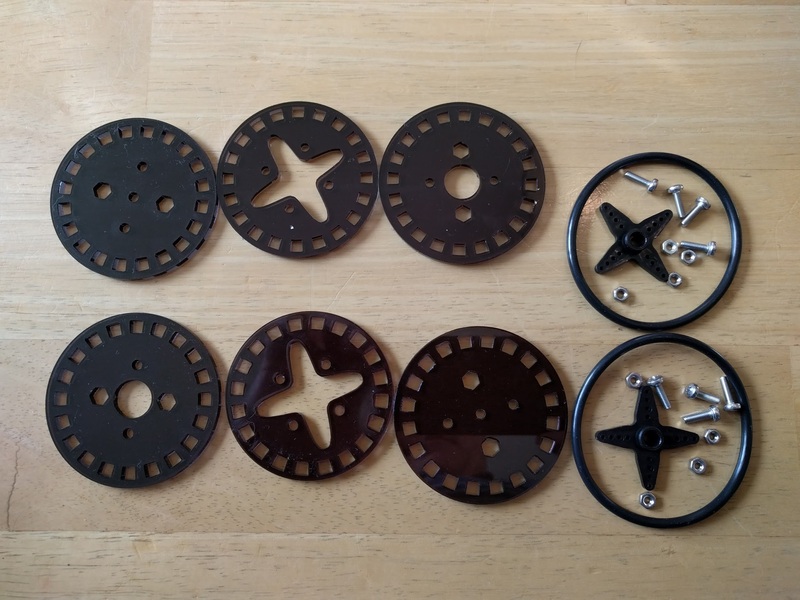 During the 2014 PiWars build, Keith used a local firm, Cedarcroft Productions, to do the laser cutting for TractorBot. The setup run by Andy includes a Epilog Mini 40watt laser cutter with a 457 x 305mm working area (A3 is 420 x 297mm). He interfaces with it through his CorelDRAWX5 software and prefers PDF files. Over the past year Keith has sent numerous projects to Andy for cutting, with mixed results. 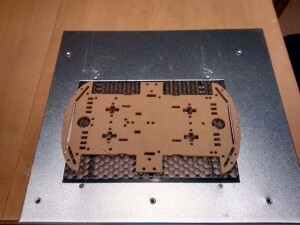 The cutting has been in either acrylic or harboard though mostly hardboard, because it’s cheap and durable for robots. Over the year Keith has gained valuable experience in how to present projects for cutting and what does and doesn’t work. Whilst this is specific to Andy’s setup it should be useful for others wishing to get their files cut. 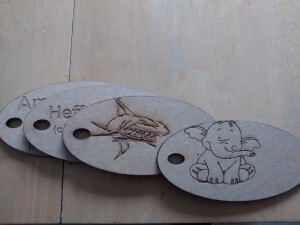 There are a few requirements, Andy’s main one is that files are in PDF format, which can be loaded into Corel Draw and simply printed to the laser cutter. Keith prefers to use AutoCAD to produce the files, since he uses it at work and with familiarity comes speed. Early in the process it became clear that PDFs produced from AutoCAD were not loading into CorelDraw so Keith switched to using InkScape. InkScape’s PDFs where much better behaved, the only caveat was that all objects should be exploded and placed on a single layer. 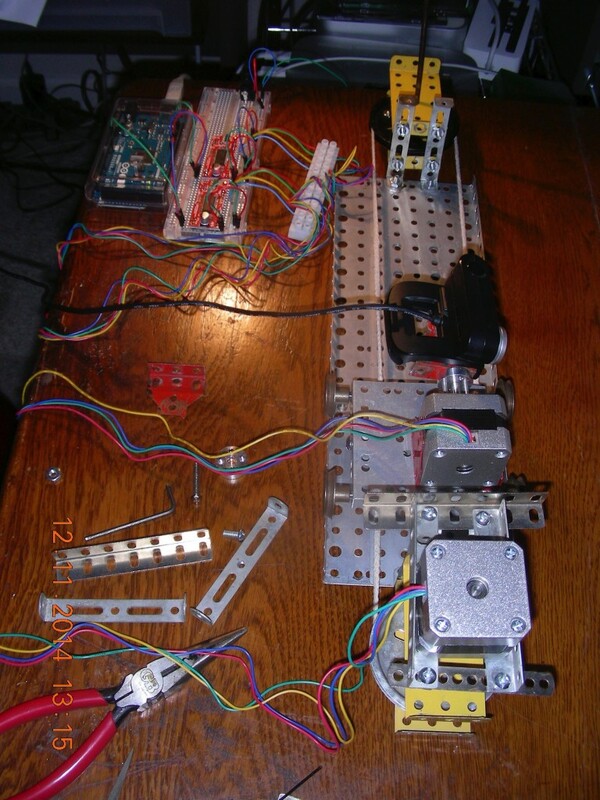 This workflow was successful and it produced the original TractorBot and its custom parts. However, Keith wasn’t happy with using InkScape, as he found it cumbersome and not precise enough. For example, it takes quite a few steps to produce a line of a set length, and for circles it appears it is not possible at all, the bounding box of the circle can be set, but this does not allow for line thickness and as such circles are often the wrong size. This year Keith investigated AutoCAD again, he also wanted a cheaper or free solution, to allow the files to be created on his own computers rather than work equipment. After sending out a request to the Makerspace, Draftsight was recommended. A free version is available on both Mac OSX and Linux and copies virtually all the AutoCAD key bindings so Keith was able to use it very efficiently. However, once again the PDFs created could not be imported into CorelDraw. Keith then looked at using Inkscape to import the Draftsight file and export it to PDF. It is possible but it did take a while to work out how to do it. The steps below describe Keith’s process. 1) Create drawing in Draftsight, using mm and ensuring the units were set to mm and export as a dxf. Within the drawing insert a scale bar so the scale can be checked at run-time. 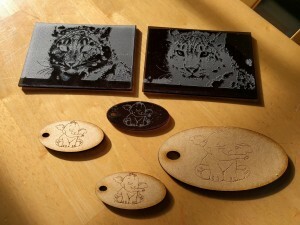 2) In Inkscape, import the DXF. File/Import, select the file and an DXF Import dialog box should appear. Ensure the check box next to “Use automatic scaling to A4” is not selected and the manual scale factor of 1.0 is shown. It took Keith a frustrating week or so to work out that this is what was needed to keep the DXF at the same scale. 3) Once the image is in Inkscape, select all objects and press CRT+SHIFT+G lots of times, this should ensure all groups or blocks are ungrouped. 4) Set the page size to 450mm wide by 300mm high and arrange the items to ensure they fit within the page foot print. 5) Again, double check all items are ungrouped and on a single layer. Delete all other layers. 6) Export to PDF, File/Save as copy, making sure to select PDF in the file type pull down box. 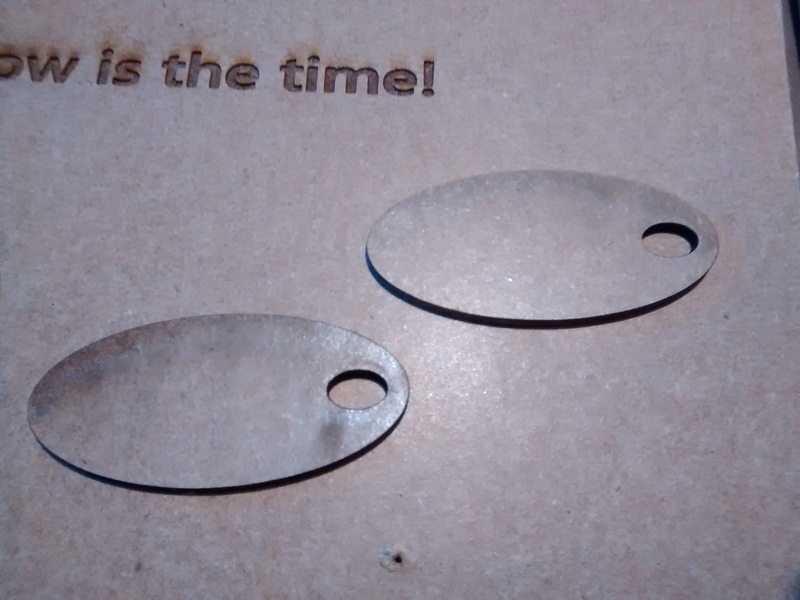 This PDF file gets sent to Andy at Cedarcroft Productions and back come the laser cut parts. Because Andy and Keith live close together it makes for a very quick turnaround which is particularly useful when several design iterations are required.